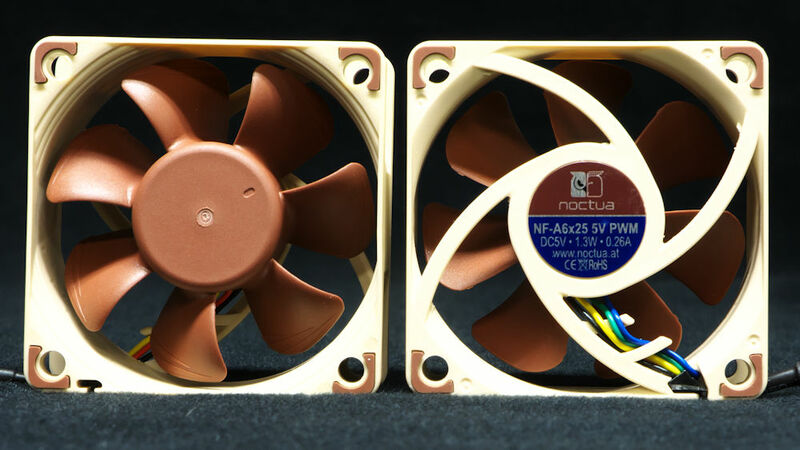 Noctua has released the NF-A6x25 5V fans. Unpacking the numbering system a bit, that means they are 60 mm fans that operate at 5 volts. They come as 3-wire voltage-controlled and 4-wire PWM fans that are 25 mm thick. Cute little ol’ things, you say? Well, as we see smaller and smaller form factors, this kind of fan should find great use. So let’s check out these little fans and see how they do. 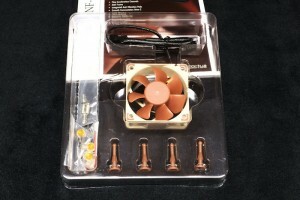 Noctua is a great maker of heatsinks and fans. According to an old review of mine, Noctua has been building fans since 2006. For their tenth anniversary, their website has been newly-designed for a clean look. Not only will you find full features and specifications on their whole product line, but it has new pictures and support for products they no longer make, from the NF-S12 to the NH-D14, and many more. That website is quite a treat. Even with high-grade products and strict quality control, the possibility of defects cannot be eliminated entirely. 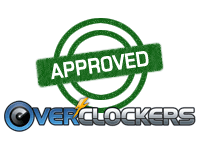 Therefore, we aim at providing the highest possible level of dependability and convenience by offering a warranty period of up to 72 months and direct, fast and straightforward RMA service. They are not kidding. 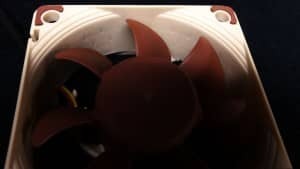 If you frequent discussion forums, you read about people contacting Noctua’s technical support and getting thoughtful feedback, often with no-cost replacement of defective products or helpful products at nominal cost. Plus, getting a package directly from Austria is fun. 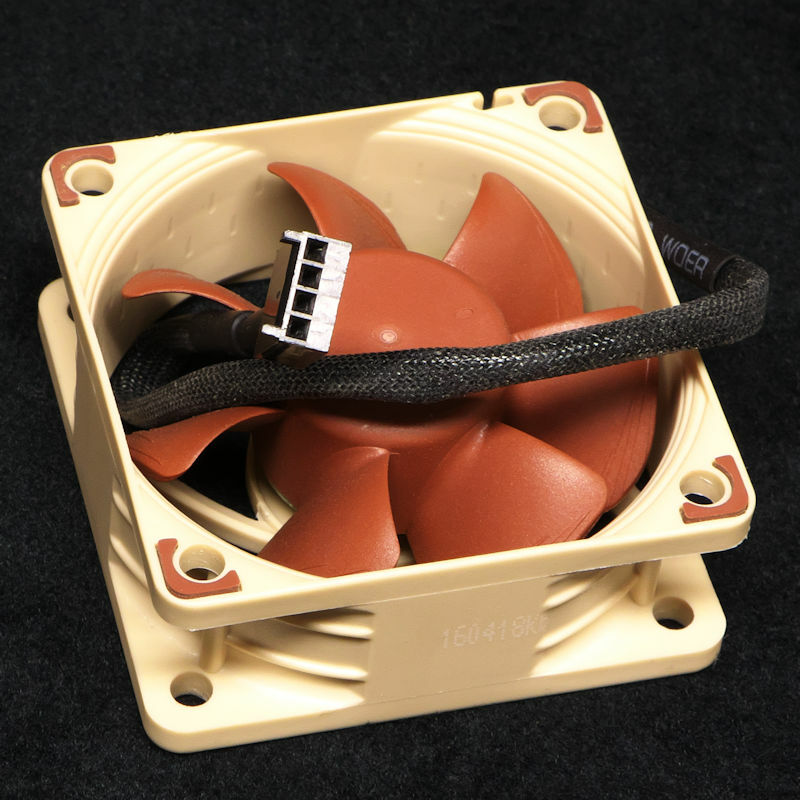 Noctua has made 12-volt versions of these fans before. Now we will see their 5-volt siblings. They are made with the same features and specifications, but differ only in voltage. First of all, let’s pick apart the name, shall we? 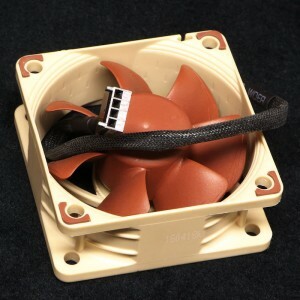 NF stands for ‘Noctua Fan.’ A6 says that this is a 60 mm member of the A series of fans, which is their current line of fans (the redux line only goes down to 80 mm, in case you were wondering). x25 says that this fan is 25 mm thick. 5V says that this is a 5-volt fan. Noctua also makes NF-A6x25 and NF-A6x25 PWM fans, which by default are 12-volt fans. As many devices using 5V fans feature proprietary connectors and documentation of the pin alignment may not be available, the fan features an integrated diode for polarity protection. This way, you’re on the safe side if you accidentally connect it with reverse polarity. … The NF-A6x25’s motor hub is smaller than with conventional 6cm fans. This allows for more blade surface area and thus contributes to the NF-A6x25’s superior airflow and pressure performance. The fan’s short 20cm primary cable minimises cable clutter in typical applications while the supplied 30cm extension provides extended reach when necessary. Both cables are fully sleeved and a 4-pin y-cable allows the connection of a second fan to the same PWM fan header for automatic control. Noctua fans are renowned for their impeccable quality and outstanding longevity. Like all Noctua fans, the NF-A6x25 features an MTBF of more than 150.000 hours rating and comes with a full 6-year manufacturer’s warranty. I took out some duplicative content and manufacturer-speak, but you can see that there are a lot of features stuffed into these little fans. 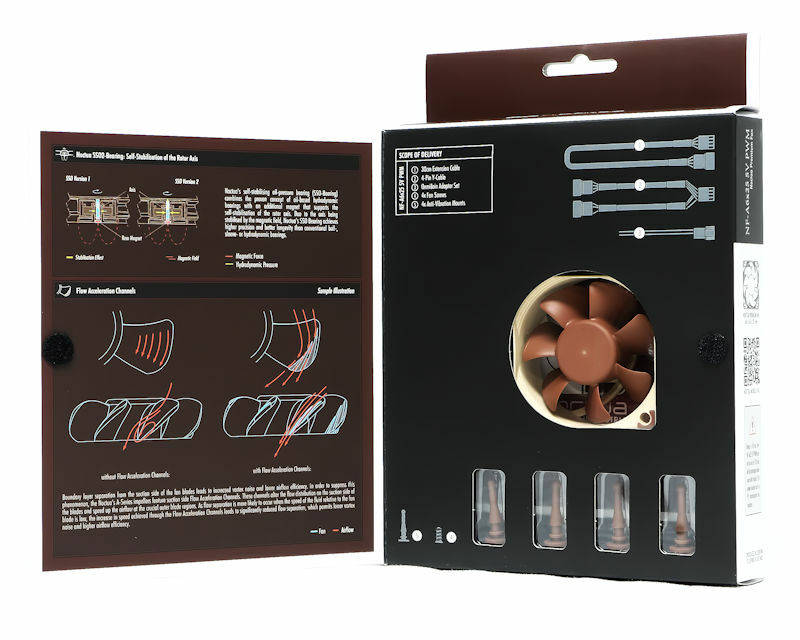 The 60 mm Noctua fans come in full retail boxes. Since Noctua sent a fixed-voltage and a PWM fan, we are able to look at the front and back of the boxes simultaneously, something we could only do if we were able to separate our eyes. You can open the front cover like a book, and see the bearing and the airflow features graphically explained to you. On the other – call it a ‘page’ – you can see diagrams of the included items, along with a window showing the fan itself. Cute! Inside we find that the fan is encased in clear plastic. Removing the top shows us just how the fan comes to us. Spread out, we find a fascinating array of accessories. First of all, we have a folded sheet of instructions on how to use the fan and its accompanying impedimenta. Next we see the PWM Y-cable. Notice that there seems to be a gap in the housing that runs from the normal ridge over the third wire to the edge beyond the fourth wire. Important. We’ll come back to that. Next is a four-wire-wide socket with only two wires, red and black, coming out of it. Looks like something that would supply you with electricity and nothing else. After that we have the PWM cable coming down from the fan, a folded-up PWM extension cable, the four anti-vibration mounts, four fan screws and an OmniJoin Adaptor Set. The printed instructions tell you that you can squeeze these to connect up your fans to power, control and RPM-reporting. This closeup shows you the built-in anti-vibration pads, but the important things to note are the stepped inlet and the inner surface microstructures. This shot shows you how to get 5 volts out of a standard PSU. 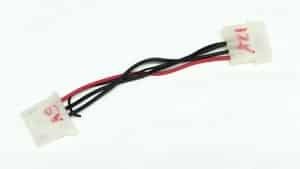 You take a Molex-Molex connector, one that usually passes 12 volts from one side to the other. Using a Molex tool, you remove the pins from the 5-volt side, and insert the 5-volt wire into where the 12-volt wire once went. What you have when you are done is a Molex connector that supplies 5 volts. 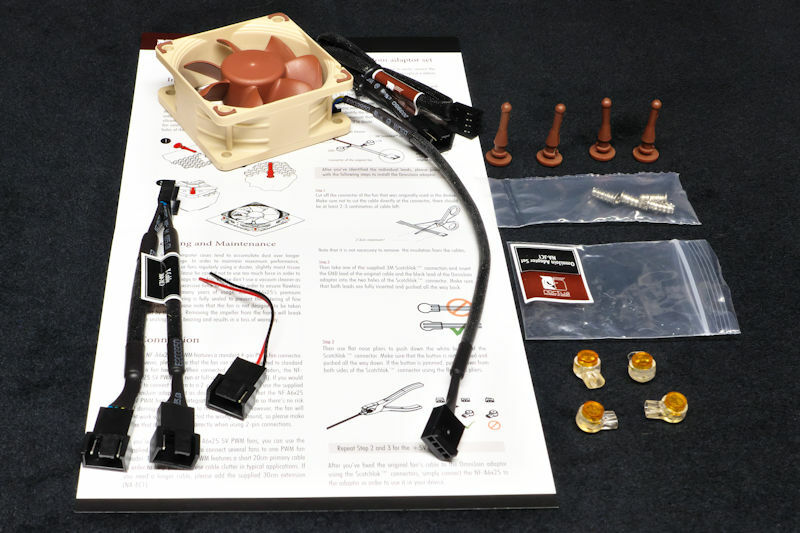 Easy to make, easy to use, and your 5-volt fan fits into your 12-volt ecosystem without any cutting involved. The fans were run in open air while their RPM and SPL were measured. 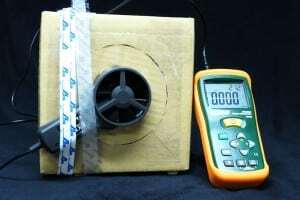 The Sound Pressure Level was measured with a Tenma 72-942 at 10 cm. The reading was then adjusted to the industry standard 1 meter. But just when I was getting ready to measure CFM’s for this review, my anemometer died. Since my old anemometer was several years old, I did some studying. Yes, there was a new kind of anemometer for sale. Yes, it was a lot less expensive than the old one. So I got that and auditioned that one. Not only did it read significantly lower than my previous anemometer, the lower reading was not consistent – I couldn’t trust it. So I ended up getting yet another of my original anemometer, the Extech AN100. 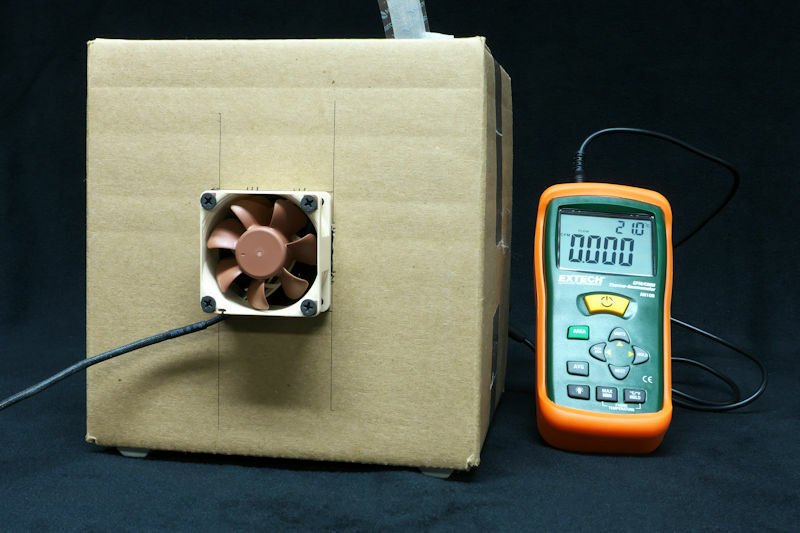 At first I built a testing box that fitted the 60 mm fan on the front side, with the “vane head” of the anemometer on a 136 mm hole in the back end. I was unhappy with the result, so I rebuilt the back end to fit the vane head exactly. The results were comparable. That’s why the gap in the socket of the Y-cable was important. It can be used as an interface between the non-standard fan connector and the standard PWM connector of the PWM splitter. Now we are all set to test these fans. The two fans ran 2848 and 2935 RPM in free air. They ran considerably faster in the box where their output was measured. 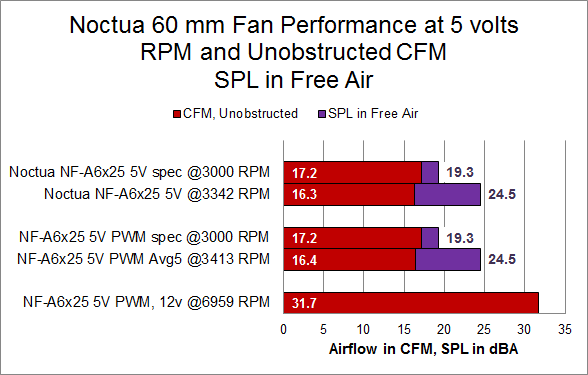 Because they are small fans, their outputs were not as large in CFM as the noise they made in dBA, so the graphic representations of the SPL and CFM are reversed from my normal review. It turned out that it did not make any difference whether the fans got their power straight from the PSU or from the motherboard’s PWM setting, so the outputs were averaged. Finally, I had to do it. Last thing, I ran a 5-volt fan on 12 volts, just to see the results. It didn’t blow up, just made a lot of noise and pushed some air. Fun. As promised, the fan does not spin under 650 RPM. The highest and lowest results varied from fan to fan, percentage to percentage. This just gives you a sense of how variable either the PWM duty percentage is, or how variable the fans can be. But even though the results aren’t exactly the same, they don’t vary much. These are cute little fans. You will probably would not have found a place for them in your computer system a few years ago, but with small form factors coming on you may need something this small. Certainly some pre-made computers from major manufacturers feature fans this small in their PSU’s. But network equipment may use a cooling fan of this size. The fans that come with the equipment may fail. Or they may be very noisy. You may wish to replace the fans that came with the equipment with quiet fans. These are quiet fans. The NF-A6x25 5V fans came with a variety of features that you normally see only on full-sized. Noctua did not stint with these, despite their diminutive dimensions. The frame “micro-structures” in particular were cute. With these little things in your hands, you have to marvel at how they made things like stepped inlets and cushioned screw holes on frames this small. The fans also come with a variety of accessories that will allow you to adapt them to the various situations you might meet. Adapting the fans to my testers was dead easy. When both fans were exposed to 12 volts, they ran until they were unplugged, so accidental exposure to 12 volts will not kill them. 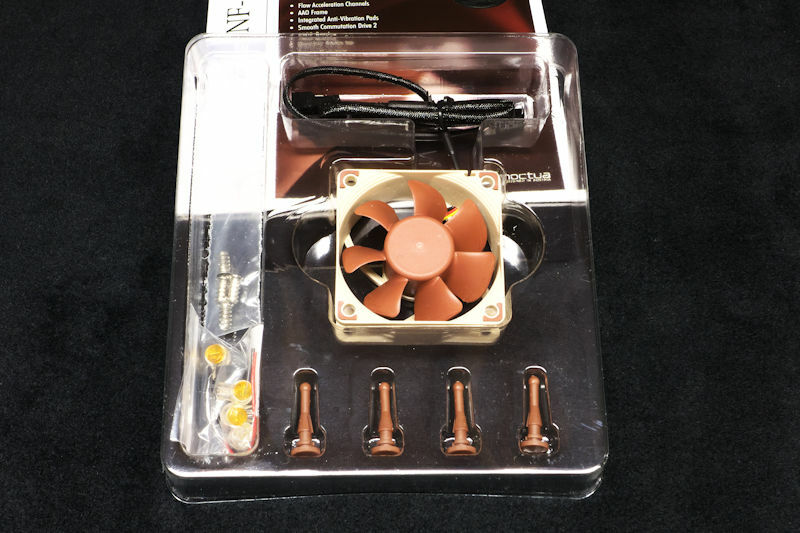 I did not test this, but Noctua says that even if you put electricity to them the wrong way, with the negative side hooked to the positive, the fans will not die. Thus you can hook them up when you don’t know which is which. Always comforting to know. Finally, the fact that a fan speeds up when you put a load on it is the sign of a good, strong fan. Imagine a little fan with a small hub being strong. Admirable.